He is currently the principal investigator of the CyCoMed research project (Cypriot Connectivity in the Mediterranean from the Late Bronze Age to the end of the Classical Period), hosted by the National Hellenic Research Foundation, Institute of Historical Research. The project has received funding from the Hellenic Foundation for Research and Innovation (HFRI) and the General Secretariat for Research and Technology (GSRT) under grant agreement no. 481. CyCoMed studies Cypriot archaeological, textual, and when applicable, numismatic evidence from carefully-selected case studies in the Mediterranean, in order to investigate how Cypriot activity and perhaps presence overseas is reflected by and on material and epigraphic evidence. Giorgos’ other research interests include early writing systems and transmission of the alphabet, archaeology of the Early Iron Age Aegean, trade and cultural interaction in the eastern Mediterranean during the Late Bronze and Early Iron Ages, Phoenician writing and inscriptions, Cypriot archaeology and writing systems of ancient Cyprus. Sherd from a black-glazed Attic cup, found at Naucratis in Egypt, and bearing a Cypriot Syllabic inscription (5th C BC). The inscription reads ka-wa-[ from right to left, with traces of a third sign where the sherd is broken on the left edge. Image © Trustees of the British Museum (listed HERE). 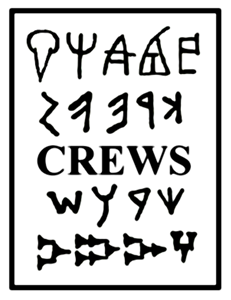 During his CREWS Visiting Fellowship (April-June 2019) he will work on writing systems of ancient Cyprus and the attestation of Cypriot inscriptions at extra-insular sites, and the possible role of material and epigraphic evidence discovered abroad as a possible statement of a Cypriot cultural identity. He will also look at how different types of Cypriot evidence relate to each other, what is their source, context and distribution over a long period of time, with due consideration of how patterns of interaction in the ancient Mediterranean changed over time and what was the Cypriot role in them. All these questions are fundamental for the progress of the CyCoMed research project.